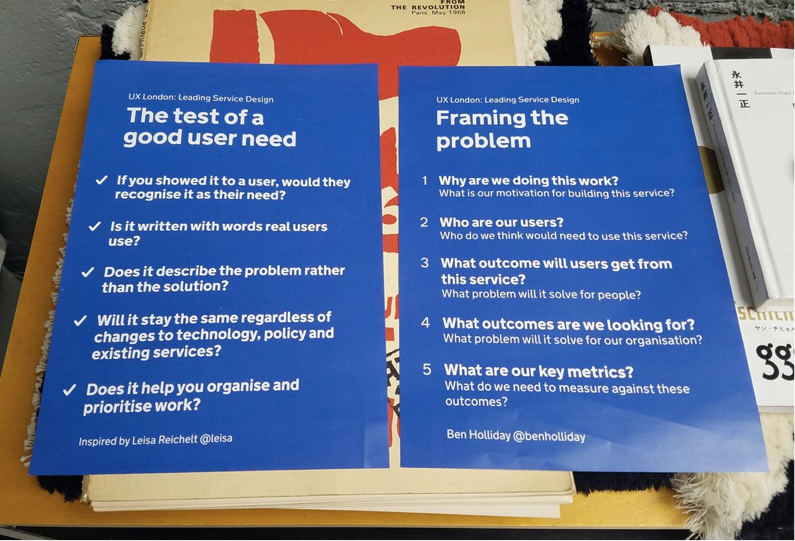 Yesterday I published a retrospective from the UX London Leading Service Design workshop I ran with Kate Tarling. We designed and printed posters for people to refer to in the workshop break out sessions and to take away with them after the event. It was good to see people sharing pictures of the artwork when they got back to their offices and work spaces the following week. For anyone that wasn’t part of the workshop, here’s the artwork to download. This poster is based on a list of prompts written by Leisa Reichelt. This poster is based on my blog post: Asking the right questions to frame the problem.